This entry was posted on Mon, Feb 20th, 2012 at 2:23 pm and is filed under Education, Humanity. You can follow any responses to this entry through the RSS 2.0 feed. You can leave a response, or trackback from your own site. 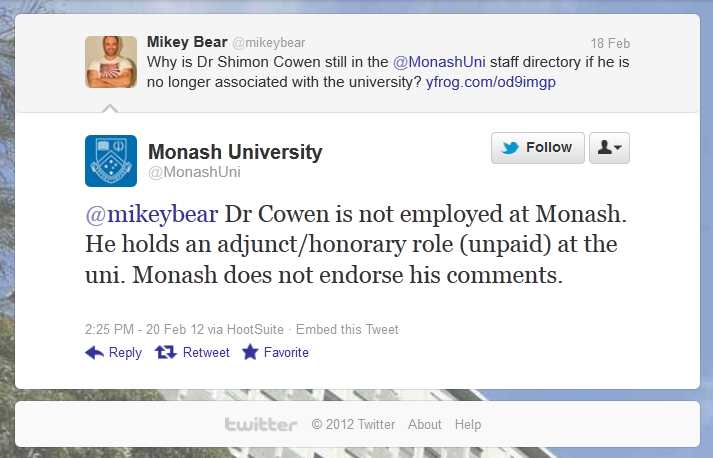 4 Responses to Monash University wants it both ways. Not good enough. If the “expert academic views” that you encourage that come from Dr Shimon Cowen allow him to concoct the dog’s breakfast of hate that appears in his name on the AFA web site, then I suggest Monash University should consider checking his academic credentials. As it stands they are not befitting of any sort of association with your fine institution.